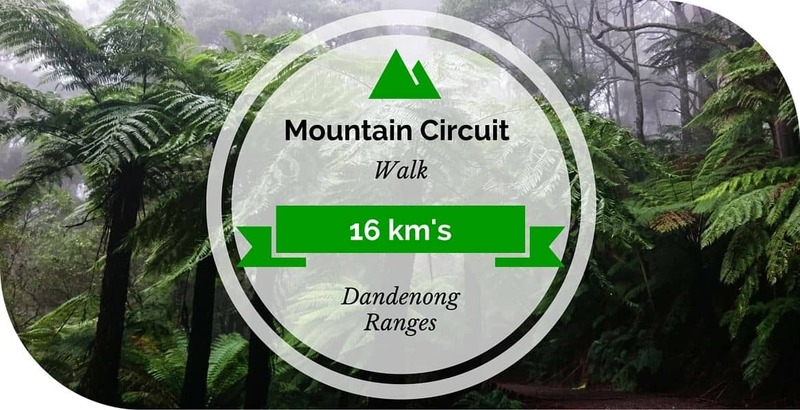 Mountain Circuit Walk – Another superb walk in the Dandenong Ranges, 16 km’s in a circuit starting in Olinda. Definitely, a good one to pack a picnic lunch to enjoy on the way or stop in at a cafe’ along the way. Parking at Olinda Recreation Reserve, Olinda-Monbulk Road or the Old Golf Course next to the reserve. From the Olinda Recreation Reserve walk along the Olinda-Monbulk road towards Monbulk, past the old Golf Course and then turn left down Chalet Road, just by the Olinda Pool. A short way down Chalet Road, turn left onto the Golf Course Track / Rock Track. Follow Golf Course Track/Rock Track, at the junction with Cornius Track, keep left. At the 4 way junction with Mathias Track, go straight ahead onto Blackhole Track. Join KC Track where it junctions with Blackhole Track. Turn left after a couple of km’s onto Bartlett Track. Bartlett Track joins onto Falls Road, walk down Falls Road for about 200 metres to join Mechanics Track on the right, which leads to Olinda Falls. Sign posting is clear to Olinda Falls. Return the same way and join the top section of Mechanics Track from the other side of Falls Road. 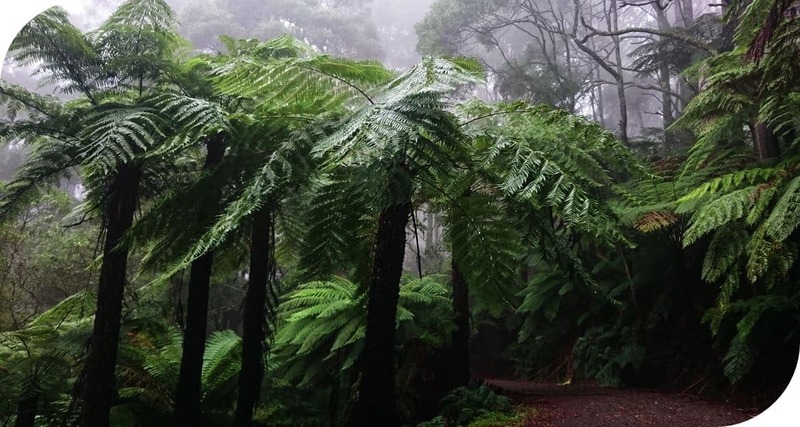 OR walk up to the Olinda Falls Picnic Area (toilets available) turn left on Falls Road then right onto Mechanics Track. Mechanics Track crosses over Farndon’s Road and then continues up to finish at the Mt Dandenong Tourist Road (beside the Mt Dandenong Pre-School). Cross carefully over the Tourist Road, there is a small track visible, walk up through the Mt Dandenong Arboretum. 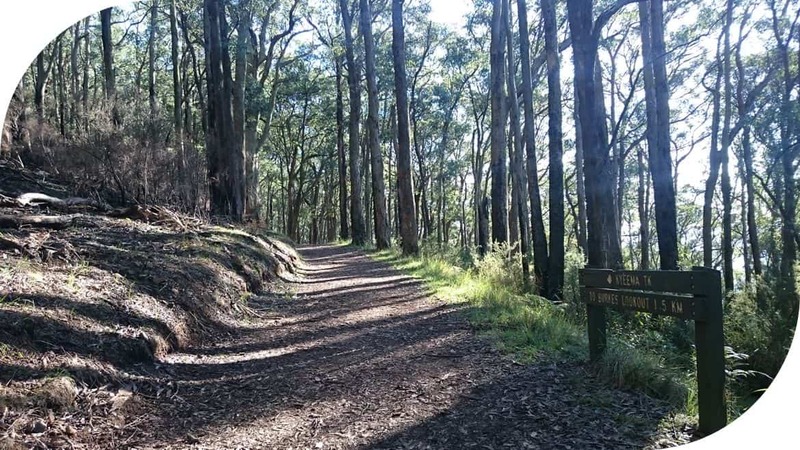 Stay to the trail on the right through the Arboretum, coming to Ridge Road where you cross over to Kyeema Track. Follow Kyeema Track, about 100m on the left is Trig Track, going up to the Mt Dandenong Summit. Cafe, views, toilets. Return the same way and continue walking along Kyeema Track towards Burkes Lookout, about 1.5 km’s away. At the junction with Tower Track, turn right and head down the hill. Turn right onto ZigZag Track, then left onto Channel 10 Track. 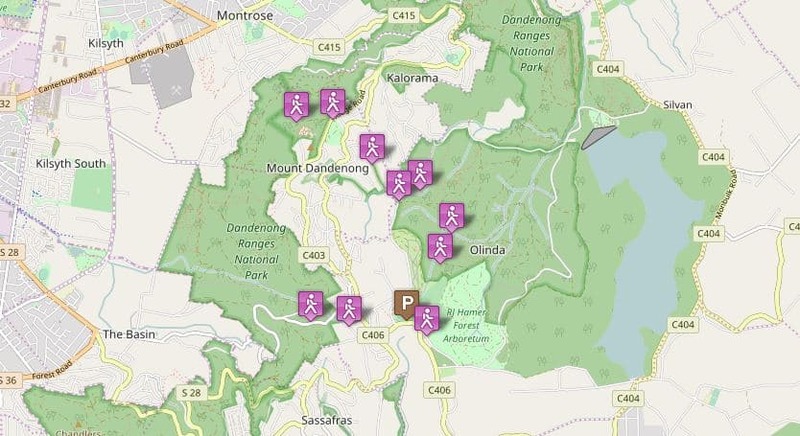 Follow Channel 10 Track until meeting Dandenong Creek Track, turn right, staying on Dandenong Creek Track until coming to the Olinda-Basin Road. 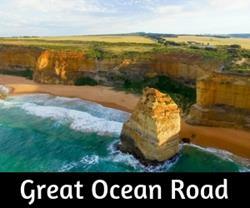 Turn left onto the Olinda-Basin Road and walk about 200 metres until Caterpillar Track on the right. 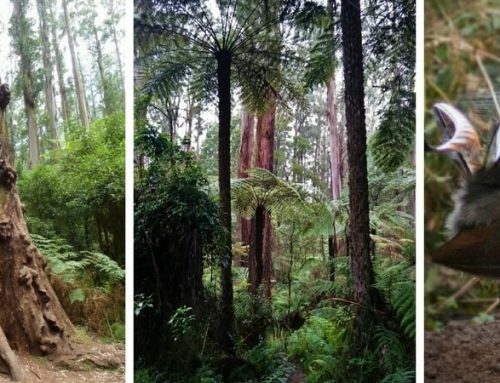 Follow up Caterpillar Track which joins Dodds Track and then continues onto Dodds Road OR keep walking up Olinda-Basin Road for 1.2km’s to Mt Dandenong Village and return to Olinda via the roads). Dodds Road joins Range Road, turn left and walk the short distance back to Olinda. 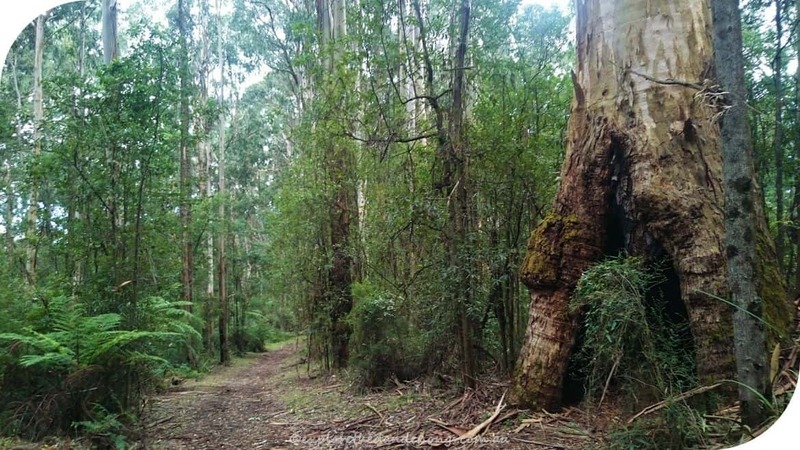 Rifle Range Track, look and listen for Lyrebirds! Bartlett Track, leading up to Falls Road. Mechanics Track heading down to Olinda Falls. 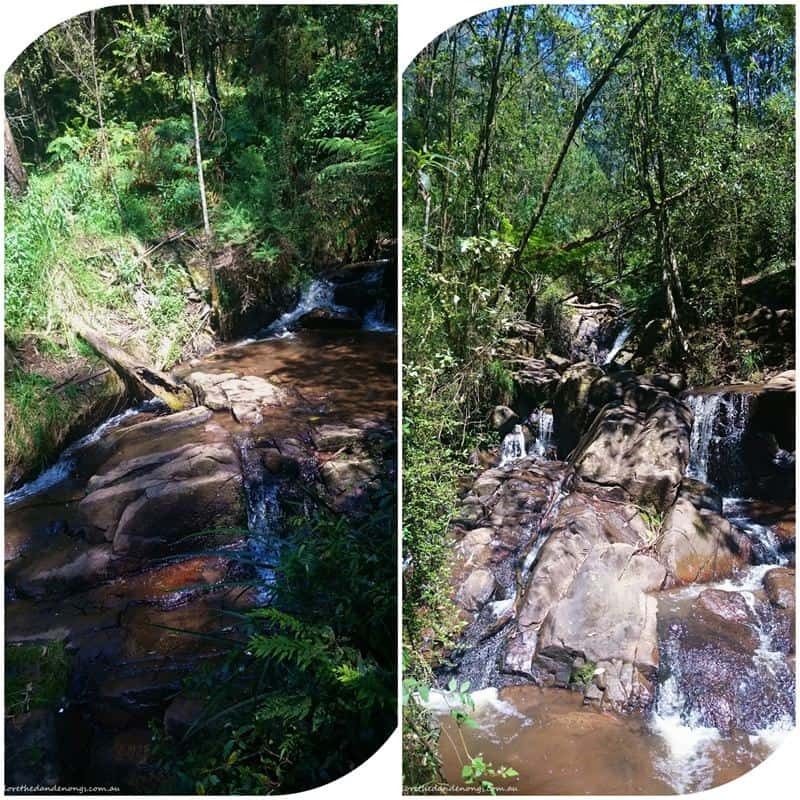 Olinda Falls: Top section (left image) and Lower Section (right image). Main track back up from Olinda Falls to the picnic area. Approaching the Mt Dandenong Tourist Road from Mechanics Track. Top of Mechanics Track, crossing the Tourist Road and into the Arboretum from the small track opposite. 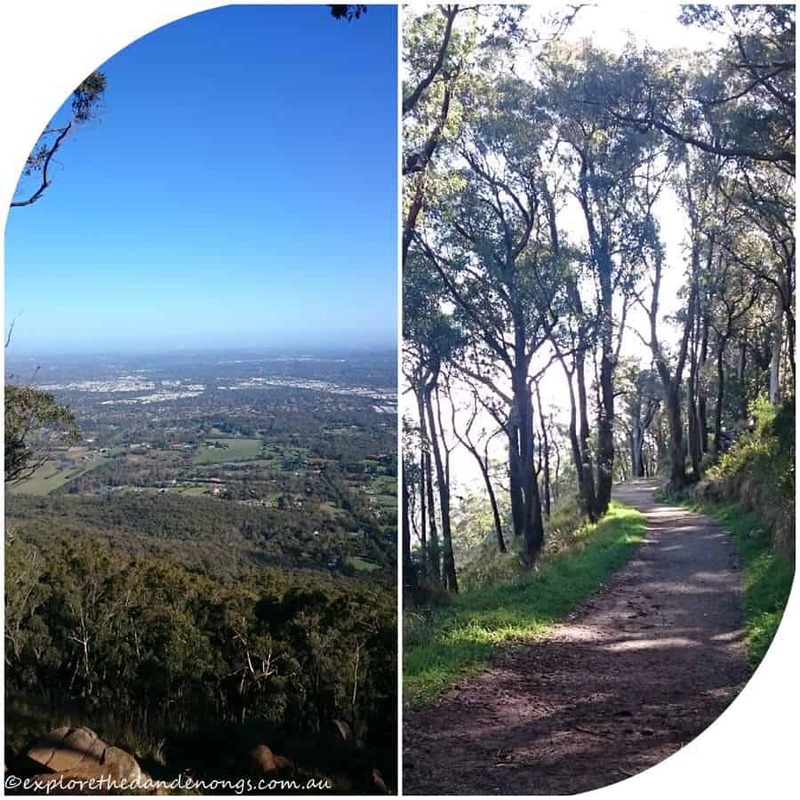 Top of Mt Dandenong Arboretum, cross over Ridge road onto Kyeema Track. 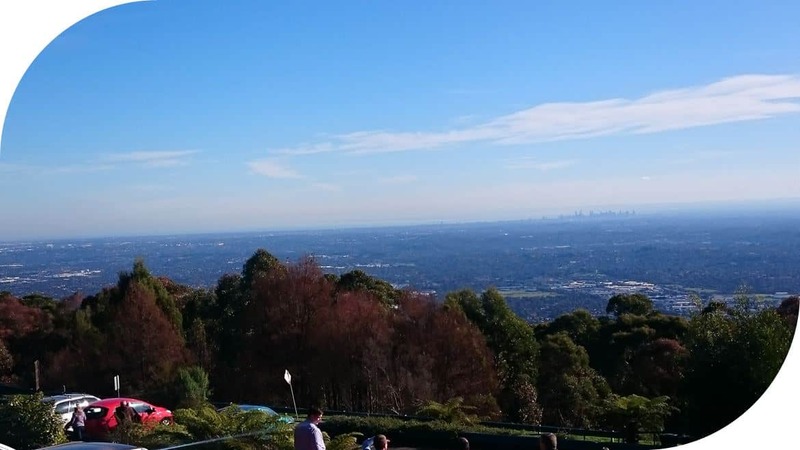 SkyHigh, Mount Dandenong. Views to Melbourne and Port Phillip Bay. Kyeema Track and views from Burkes Lookout. 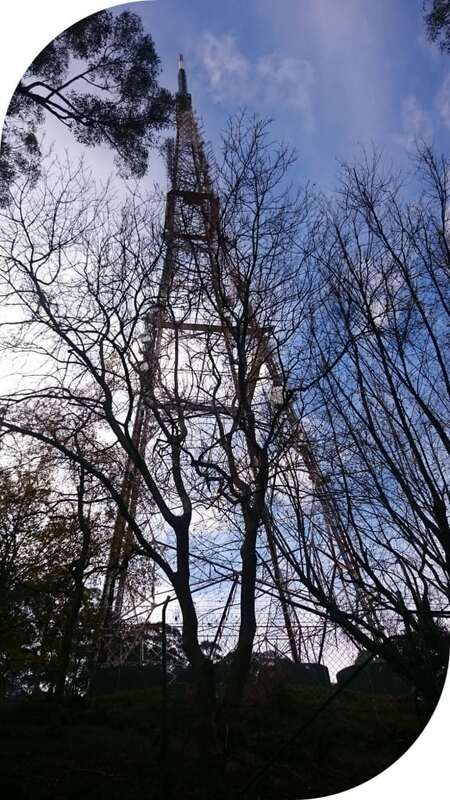 Channel 10 Tower from Tower Track. Dodds Track, not too far from the end of the walk in Olinda. Hello! My friend and I are looking to do this walk, however we are both too young to drive. 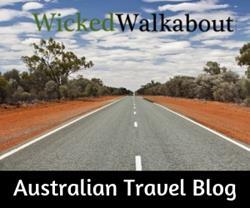 Do you know how we could access this walk via public transport? It looks like a great walk! I hope you do come up and do the walk! We did this walk today and your instructions were so useful, really easy to follow and up to date. thank you so much!! It was a great walk, lovely tracks, gorgeous views. It took us about 6 hours, but we took lots of breaks to explore and we stopped for lunch at skyhigh. I’m glad to hear you enjoyed the walk, Emily. 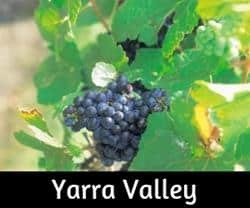 It is one of my favourites as it takes in so much of the region. Good that Caterpillar track is open and thanks for confirming it. 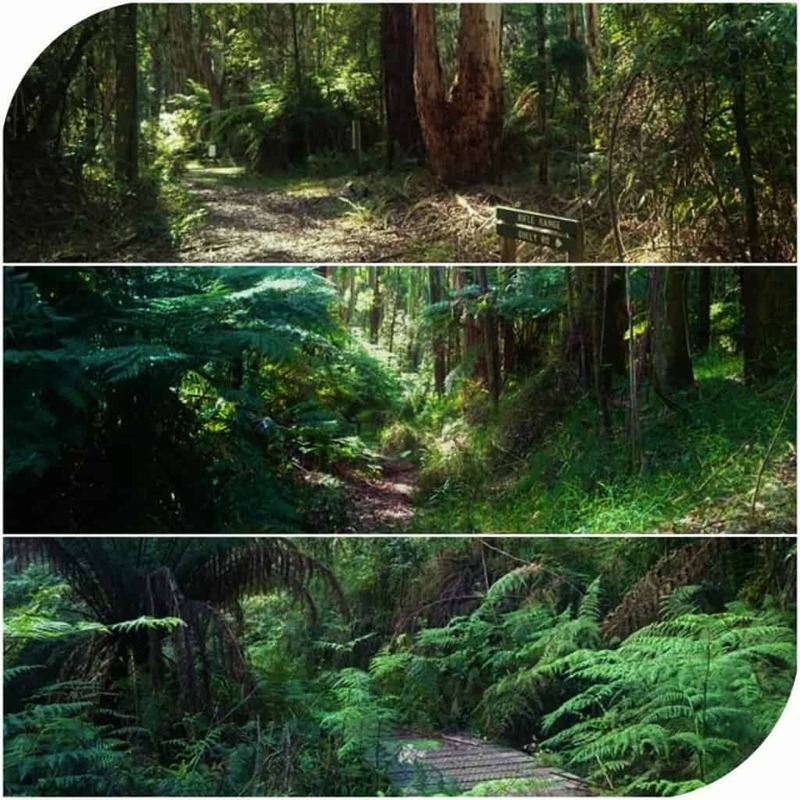 My sister and I did this track recently and found caterpillar track was closed – path was overgrown and had a log marked ‘closed’ blocking the entrance – and this meant we had to walk olinda-basin rd back to olinda as we were unsure of any alternate tracks to take. If anyone is familiar with this area and knows of any other track that would be good to take back to olinda, please comment below. I think you maybe did not walk up quite far enough as the track is open still, it runs up behind a couple of houses on the right. 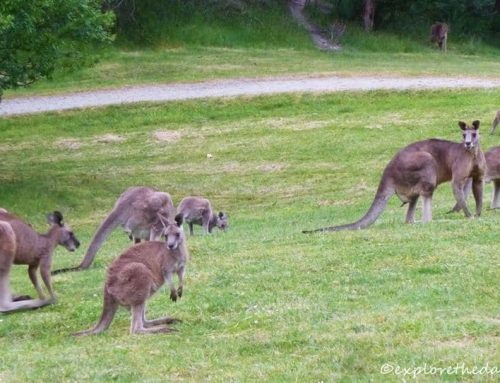 They are the first homes you will see as you walk up the Olinda-Basin Road. Does anyone if dogs are allowed on this track? I’d love to take my dog…just not sure if it’s possible? Hi Danielle, Dogs are not allowed on this track apart from the Rock Track section, which is not a long distance at all I’m afraid. 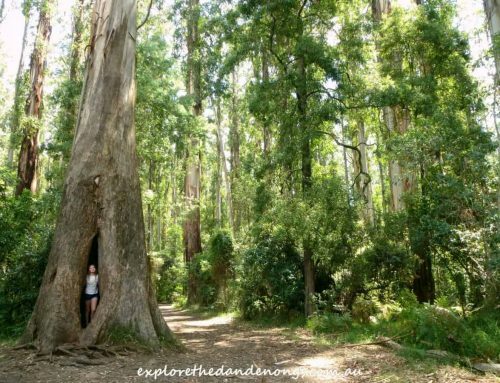 The emerald to Sassafras track allows dogs the whole way, it is 15 km’s each way, though would involve a car shuffle. That’s great you did the walk, and I know what you mean about your calves! My partner and I did this exact circuit today (Good Friday) and enjoyed it thoroughly. Only issue we had was that Mechanics track was not labelled when turning right off Falls rd. Google maps seemed to have it labelled as Cascade track, either way, it was no drama. The course was a good mix of dense forest and open track. 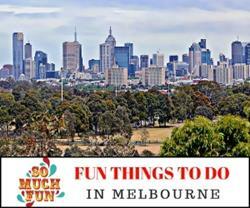 Hi Dean, What a great way to spend the day, this is one of my favourite walks as it takes in so much. some of the tracks do occasionally come up with a different name to what they are known these days, and this can vary on different maps. I am thinking a little ‘homemade’ sign on the corner may not go astray! Thanks for sharing your observation and day out, I hope you do many more walks in the hills. Thanks very much for providing details on this walk – my partner and I did it this weekend, and had a great time – found the route plan very easy to follow. Hi Meena, I’m glad you enjoyed the walk and found the directions easy to follow. It is a great hike and nice that it is easy to pop into the village for a snack too!